Savor Madrid’s finest wines on this 3-hour Madrid historical walking tour with wine and food tasting. Hear fascinating anecdotes from Madrid’s history as you stroll along the picturesque medieval streets of its La Latina quarter. Stop into three taverns to taste fine Spanish wines, including Rioja, Ribera red wines, and Rías Baixas white-wines. Learn about their history and evolution while sampling an array of tapas. Begin your tour in Madrid’s picturesque Plaza Isabel II, where you´ll head to Puerta del Sol to sample traditional Spanish wine alongside delicious Madrid-style corquetas at an establishment operating since 1860. Then you´ll head to the wine tavern district of La Latina, stopping at two of Madrid’s top family-run taverns for some of the city’s tastiest wines and tapas traditional such as cold cut meats and cheeses. You will also savor a delicious plate of "huevos estrallados", a mix of fried potatoes, Iberian ham, and fried eggs, a local favorite. This district’s specialty tapas are called pinchos, or tostas, tapas ingredients piled high on a slice of crunchy bread. Choose your favorite from the novelty tapas on display at the bar. All these amazing tapas and wine alongside a fun and dynamic explanation of Madrid's past and present history. 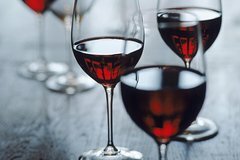 A central part of the Mediterranean diet, wine dates back more than 8,000 years, though Spanish wine has just recently begun receiving the international recognition it deserves. Spain’s weather provides ideal growing conditions for top quality grapes. In fact, many fine French and Italian wine producers import Spanish grapes, given their high quality. Indulge in some of the most highly acclaimed Spanish Rioja, Ribera del Duero, and white Rías Baixas wines before returning to your departure point.